Chiyaan Vikram has joined hands with Dr Agarwal’s, one of the leading eye hospitals in Chennai, to urge people to pledge their eyes, as the country “badly needs a large number of eye donors” to help the visually challenged. The actor, who had pledged his eyes two years ago and had asked his fans to follow the suit, added: “I realised the difficulties faced by the visually challenged while acting in Kasi. Let’s add light to their lives by donating eyes”. 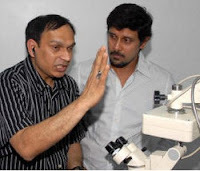 Producer Kalaipuli S Thanu, who too was present at the campaign, said he would soon make a short film on eye donation and would present it to the Dr Agarwal’s hospital so that they could create awareness on the crucial issue.